Wells is one of the most influential writers in the English language. His major scientific romances The Time Machine and The War of the Worlds have never been out of print. Hailed as a genius from his debut, he has helped shape the imagination of a range of writers from George Orwell, to Jorge Luis Borges, to every science fiction writer who has come after him. While Wells is remembered more now for his science fiction than Utopian ideas of world government, the political Wells still might have something to teach us. While political leaders of various stripes use nationhood as a way of putting barriers between human beings, Wells’s message of our shared origin, universal human rights and international co-operation might suggest to us instead a direction for a more hopeful future. No writer is more renowned for his ability to foresee the future than HG Wells. His writing can be seen to have predicted the aeroplane, the tank, space travel, the atomic bomb, satellite television and the worldwide web. His fantastic fiction imagined time travel, alien invasion, flights to the moon and human beings with the powers of gods. This is what he is generally remembered for today, 150 years after his birth. Yet for all these successes, the futuristic prophecy on which Wells’s heart was most set – the establishment of a world state – remains unfulfilled. He envisioned a Utopian government which would ensure that every individual would be as well educated as possible (especially in science), have work which would satisfy them, and the freedom to enjoy their private life. His interests in society and technology were closely entwined. Wells’s political vision was closely associated with the fantastic transport technologies that Wells is famous for: from the time machine to the Martian tripods to the moving walkways and aircraft in When the Sleeper Wakes. In Anticipations (1900), Wells prophesied the “abolition of distance” by real-life technologies such as the railway. He stressed that since the inhabitants of different nations could now travel towards each other more quickly and easily, it was all the more important for them to do so peacefully rather than belligerently. 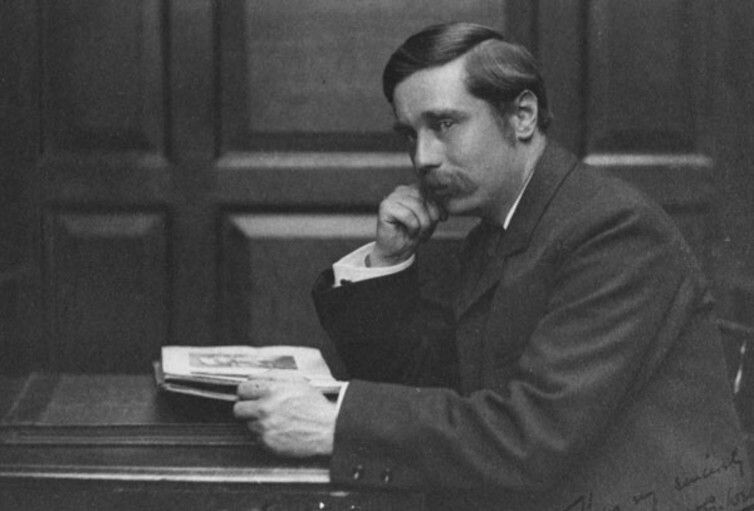 Wells studying in London, c. 1890. Wells’s social thinking had its origins in his training as a scientist: having won a scholarship to the Normal School of Science (now Imperial College, London), he was taught biology by “Darwin’s bulldog”, T H Huxley. His scientific education first stimulated what are now his most famous books, his early scientific romances. From The Time Machine (1895) on, his work was always political, but this dimension was given extra urgency by the catastrophe of World War I. Frustrated by such a spectacle of the failure of human planning, Wells proposed to re-teach the world. The collaboratively written The Outline of History (1919) claimed to be the first transnational history of the human race, telling the story of human beings from our early evolution. In the hope that his readers would, on learning of the common origin of all humans and so of the fiction of race and nationality, outgrow the idea of the nation state, Wells optimistically carries his story past the present day into the future. The Outline’s 24th part recounts the future history of the “United States of the World”. While controversially received, especially by its Catholic readers, The Outline of History was Wells’s best-selling book in his own lifetime: printed in the millions, and translated into multiple languages. The Science of Life and The Work, Wealth and Happiness of Mankind followed, instructing his readers in biology and the social sciences. 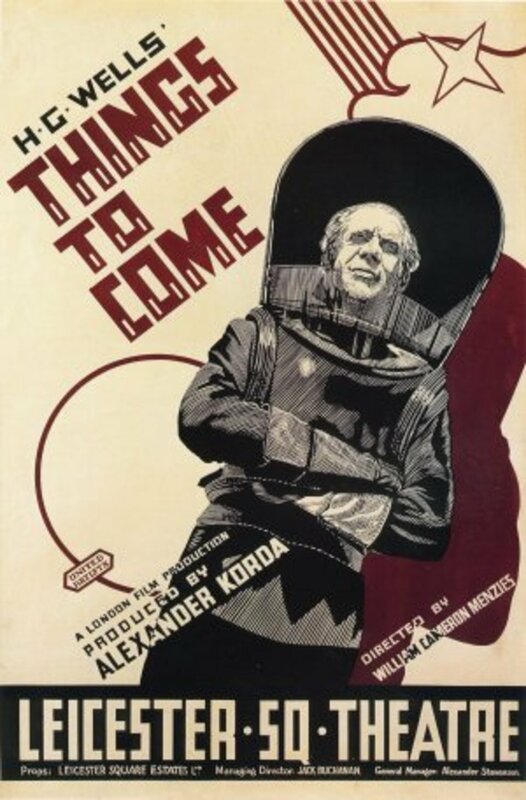 Wells complained that the Outline had become more of a fashionable book than an influence on world politics, so he turned to the technology of cinema to spread his message more widely. 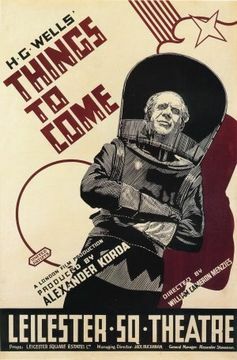 In Things to Come, directed by Alexander Korda, an adaptation of Wells’s The Shape of Things to Come, Wells anticipates aspects of World War II, such as the aerial bombardment of civilian populations. Civilisation is almost destroyed, but the international group of airmen Wings Over the World lead humanity to reconstruction and, eventually, the conquest of space. Today, given the role that national identity continues to play in human beings' efforts for greater self-determination, the prospect of Wells’s world state seems even less likely. One surprising legacy remains, however, from Wells’s forecasts of a better future for humankind. Letters from Wells to The Times led to the Sankey Committee for Human Rights and Wells’s 1940 Penguin Special The Rights of Man; Or What Are We Fighting For? (recently reissued with a preface by novelist Ali Smith). Wells argued that the only meaningful outcome for the war would be the declaration of an agreed set of universal human rights and an international court to enforce them. Wells is one of the most influential writers in the English language. His major scientific romances The Time Machine and The War of the Worlds have never been out of print. Hailed as a genius from his debut, he has helped shape the imagination of a range of writers from George Orwell, to Jorge Luis Borges, to every science fiction writer who has come after him. While Wells is remembered more now for his science fiction than Utopian ideas of world government, the political Wells still might have something to teach us. While political leaders of various stripes use nationhood as a way of putting barriers between human beings, Wells’s message of our shared origin, universal human rights and international co-operation might suggest to us instead a direction for a more hopeful future.